Programme Mile End offers a fresh start for students, and a chance for them to discover who they are, where they want to go, and the belief that they can get there. Although we sometimes accept students throughout the school year, applications are taken in June for the following academic year. We also reserve open spaces for late admissions in August and early September. 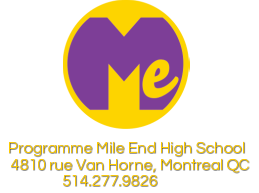 Interested students and/or parents should call the school for an interview at 514-277-9826 and ask to speak to the Head Teacher.